When we were kids, anytime a birthday would roll around, my mom would ask my sister and I what we wanted on our birthday cakes. My requests varied each year, ranging from Peanuts-themed cake to Sesame Street and (shocker) a hockey player. It was a foregone conclusion that the cake would be a standard quarter sheet cake with traditional icing. 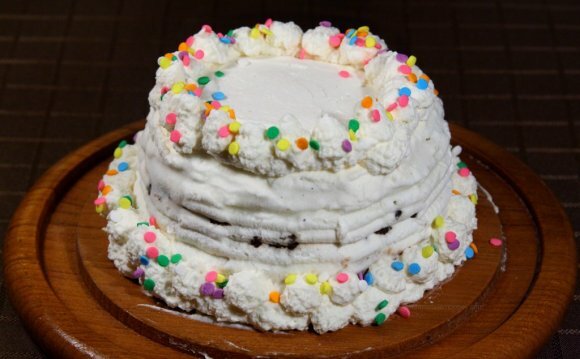 Somewhere around middle school, I realized that regular cake just didn’t really do much for me; instead, I much preferred the ever-popular ice cream cakes from Dairy Queen – layers of chocolate and vanilla ice cream sandwiching a fudge and chocolate crunch filling. It was amazing, and it was the only birthday cake I requested through high school and beyond. As much as I love it, however, I always thought that the cake could stand to have that fudge filling at least doubled, and maybe a bit more of the chocolate crunchies, as well… but I didn’t want the crunchies quite so… crunchy. What to do? Create my own version at home, of course. I used a springform pan to layer chocolate ice cream on the bottom, then top with my homemade hot fudge sauce, which I could seriously eat with a spoon. As for the chocolate crunch layer, I wanted a larger layer, but like I said, I didn’t want them quite as crunchy. To solve that issue, I chopped up Oreo cookies, cream center included. The cream center kept the chopped up cookies softer once they were frozen, so it was a perfect solution. On top of that, I layered the vanilla ice cream and covered with whole cake in a whipped cream frosting and garnished with rainbow sprinkles. I was ecstatic about how this turned out, and that I could finally have the DQ ice cream cake I’d always wanted with a super thick hot fudge layer and lots of soft chocolate crunchies (that might be an oxymoron!). I served it for dessert on Sunday; everyone absolutely loved it and said it was amazing (better!) knock off than the original. If ice cream cake is your jam, this would make a perfect summer dessert! A copycat of my favorite DQ ice cream cake, complete with a fudge filling and chocolate crunchies! 1. Lightly butter a 9-inch springform pan. 2. Spread the chocolate ice cream into an even layer in the bottom of the springform pan. Place in the freezer for 30 minutes. Spread the hot fudge sauce over the chocolate ice cream (if it had been chilled, you'll need to rewarm briefly), then sprinkle the chopped Oreo cookies, pressing lightly so that they adhere to the hot fudge. Return to the freezer for at least 30 minutes. Lastly, dollop the vanilla ice cream over the chopped Oreos and gently spread into an even layer. Freeze for at least 8 hours, or overnight. 3. At least 1 hour (and no more than 12 hours) before serving, unmold the cake. To release the cake from the pan, invert the cake onto a plate or cardboard round the same size and wrap a hot kitchen towel around the cake pan, keeping it there for 30 seconds, or until the cake loosens, and slide the pan off. Remove the bottom of pan. Top with a serving plate and turn the cake right side up. Return to the freezer for at least 10 minutes. 4. While the cake is in the freezer, make the whipped cream. Combine the heavy cream, sugar and vanilla extract in the bowl of a stand mixer. Using the whisk attachment, whip on medium-high speed until the cream is light and fluffy and holds a medium to firm peak, 2 to 3 minutes.